One of the things most of us have in common is we spend more time in meetings that seemingly get in the way of getting work done than helping us accomplish anything. Most of us would say that there are too many meetings that have no or little agenda, are focused on information sharing rather than decision making, and that are unproductive or worse, counterproductive. Let me suggest using the IDEA model to make your meetings productive and arenas for getting work done rather than getting in the way of getting things accomplished. Focus on Issues or Initiatives: Information sharing can be done in other ways — status reports, shared drives, etc. Only share information in a meeting when it is needed to help resolve an issue during the meeting or move an initiative forward as a result of the meeting. Make Decisions: Make sure you have the people in the room who can make or influence decisions. Use the time in the meeting to discuss issues or initiatives and then make a decision about how to proceed. Establish Actions: Decisions are only as good as the actions that follow. Leave every meeting with a plan for action on any decisions made in the meeting. If it wasn’t possible to make a decision, what has to happen before the next meeting to make it happen? Overtly review the actions, who is responsible and when it will be completed. Too many times we leave a meeting thinking we are all on the same page, only to find out later that there were different interpretations of what the next steps were and who was going to take them. 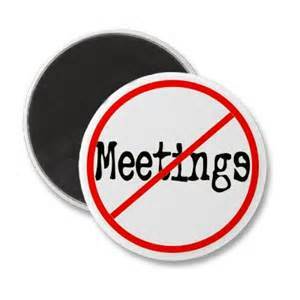 If you really want to kill meeting productivity, have that happen a few times and you’ll really feel like those meetings are a waste of time.